How your new, undermount sink is fitted into your kitchen countertop should be more than just a visual preference; it should be compatible with your kitchen lifestyle. There are three ways to install an undermount sink. A positive reveal has the countertop trimmed short to expose a portion of the sink’s rim. A negative reveal lets the countertop completely cover the rim of the sink, and hang slightly over the open bowl. And, if the countertop and the sides of the sink line up perfectly, it’s a flush reveal. Let’s look at the significance of each of these approaches. The positive reveal is often chosen when the soft curves near the rim of a sink add to the overall appearance. This is probably most apparent with a smooth, porcelain sink. It allows use of the entire basin and some of its rim. However, that exposed ledge collects debris and will need constant cleaning. Many believe that showing a mere eighth or quarter-inch of the sink rim offers the best overall look. But, some see that ledge as support for a cutting board or grid, requiring more of the rim to be exposed. Although countertop fabrication methods are becoming more and more precise, any unevenness in the rim’s perimeter will be noticeable in a positive reveal. A negative reveal is the easiest to create since any imperfections in alignment are hidden below the counter. 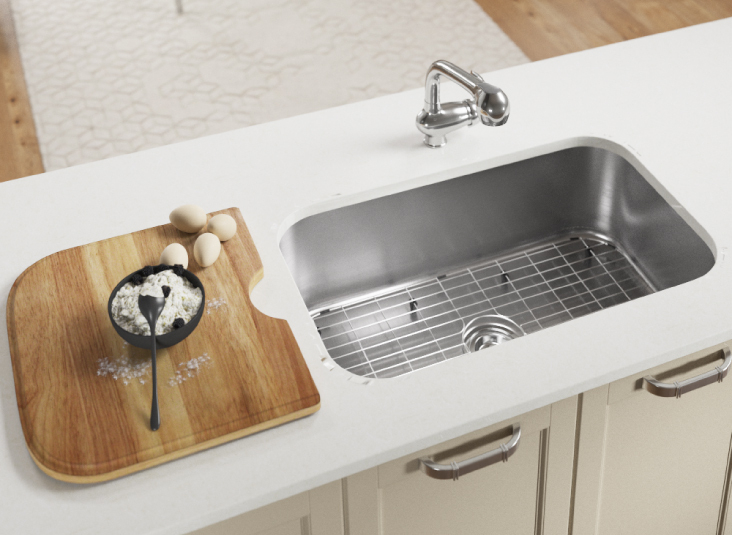 This format offers the ability to sweep any countertop debris and spills directly into the bottom of the bowl; with no sink edge to catch them. Some fear that mold and bacteria can grow on the moist underside of the overhang. It might; but an occasional wash down should suffice in preventing that. Caution should be taken not to catch the protruding lip in a negative reveal with glasses or other fragile dishes. The most difficult format to mount is a flush reveal, causing many installers to dissuade you from choosing it. But when done right, it’s impressive. Depending on the sink design, a small crevice can still be created where the slight curve of the rim meets the counter. Diligent cleaning of this groove is a must, and is why right-angled sink designs are best for flush reveals. Undermount sinks are still at the height of their popularity in the kitchen, but review your kitchen habits to determine the mounting style that best suits you.